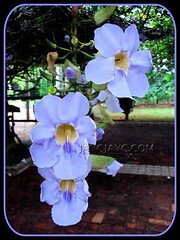 An impressive flowering vine with long dangling flowering stalks that are beautifully decorated with numerous lavender-blue to lilac-coloured blooms. We sighted this beauty for the first time at Botanical Garden Putrajaya (Taman Botani), about 2½ years ago and were mesmerized by its spectacular display. Trained over an extremely large pergola, the Blue Trumpet Vine was seen to cover the whole structure with its dense foliage, providing shade for the pathway and much attraction with its showy flowers to lighten the darkness in lovely contrast. 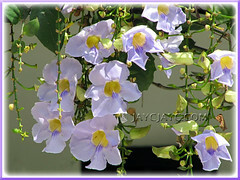 Though beautiful as an ornamental vine and beneficial as a medicinal herb, Thunbergia laurifolia can be beastly too! It has been classified as a threatening weed or pest that can smother other trees and native vegetation, as well as shading out and killing the understorey in the wet tropics of certain regions. The three Bs of Thunbergia laurifolia, huh! Etymology: The genus Thunbergia is named after Carl Peter Thunberg, a famed 18th-century Swedish botanist and explorer. Features: Thunbergia laurifolia is a species of the genus, Thunbergia that comprises of about 200 species of annual or perennial vines. Though it is an evergreen perennial vine that is popularly grown as a garden ornamental in the tropics, T. laurifolia like its close relative, Thunbergia grandiflora (Bengal Clcok Vine), has been declared an invasive weed in Queensland, Australia and some other regions. A vigorous and rambunctious climber that will easily cover any large structure such as a pergola, trellis or espalier and even up into treetops that it scrambles for support. It has dense foliage that is generally dark-green in colour with the exception of T. laurifolia variegata that has variegated leaves. Leaves measuring 7-18 cm long and 2.5-6 cm wide, growing in opposite pairs along the semi-woody and slender stems are heart-shaped or elliptic, slightly toothed and narrow to a pointed tip. T. Laurifolia or Laurel Clock Vine as commonly known is a prolific bloomer that flowers almost throughout the year. It bears numerous clusters of gorgeous trumpet-shaped mauve-coloured flowers, up to 8 cm long and 6-8 cm wide, on long pendulous branches. Each large flower has a short broad tube, white outside and yellow inside, and frilled with 5 roundish, lavender-blue or pale violet to mauve-coloured petals, one of which is larger than the rest. Though these non-scented, one-day bloomers open in the early morning and close in the same evening, its abundance make it seem to be flowering non-stop for days on end. Flowers will eventually develop into inconspicuous, elliptical, brown seed capsules, 1 cm long by 4 cm wide, each containing two to four seeds that may be used for propagation. Their gorgeous blooms are magnets for carpender bees, ants and other nectar-feeding insects. Plant this lovely climber if you’re a nature lover. It’s a sturdy vine that develops a very tuberous root system which can easily produce off-shoots, especially when severed or cut. Culture (Care): Thunbergia laurifolia, a hardy and robust tropical flowering vine, can be so easily grown and needs the least maintenance. Soil: Moderately fertile humus soil with a mix of sand and should be well-drained. Adaptable to most kind of soil. For subtropical regions: Hardiness: USDA Zone 10a-11. Being frost-sensitive, it thrives only in tropical and frost-free subtropical regions. Elsewhere, young plants will die back when temperatures are below freezing point. Protect from frost by growing as a container plant indoors in greenhouses. Propagation: Can be propagated by seeds or easily by stem cuttings or shoots that sprout readily from tuberous roots. 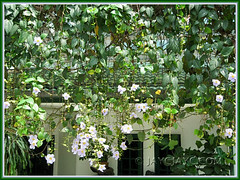 Usage: Grow Thunbergia laurifolia as an ornamental vine in the gardens. Like most flowering vines with vigorous growth habit, it’s excellent for covering garden fences, trellises, arbors and arches or espaliered on concrete structures to add beauty, colour and interest to one’s garden. 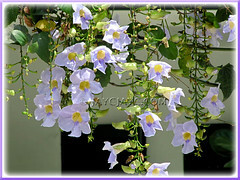 The pictures below of the Laurel-leaved Thunbergia give an idea of its usage. 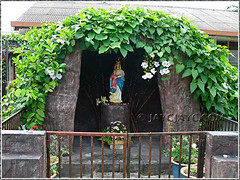 The left shows the lovely climber decorating the concrete arch of the Blessed Virgin’s grotto at the Church of St Paul the Apostle, Kuala Kubu Baru. 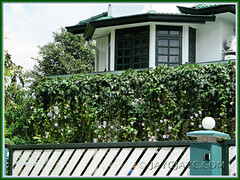 On the right is an image of the healthy and lush vine, beautifully draped over a 4.5-meter-wide arch at the frontage of a 3-storey bungalow, creating a marvelous screen or curtain – truly spectacular when it’s in full bloom! 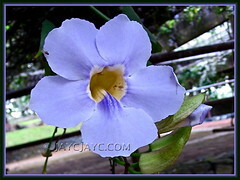 Disregarding its weedy nature, this beautiful Thunbergia laurifolia has medicinal benefits too. It is widely used as a traditional medicine, especially in Thailand, Malaysia and India. The leaf sap is used for menorrhagia, ear infections and deafness, and the poulticed leaves to soothe cuts and boils. Leaves are also used as an antipyretic agent and antidote for scorpion venom and dried leaves as a herbal tea to treat drug and alcohol abuse. Besides, it has antioxidant, antibacterial, antifungal, anti-inflammatory and antitoxic properties. More details at eHow.com. I have seen this vine at a wedding photography centre in PJ and it is indeed very beautiful. Since, it’s native to our country, you may probably find it being grown at the Secret Garden of 1-Utama too, huh! Thanks for dropping by, A. Belle! 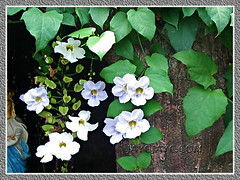 Indeed it has been some time since I last visited your post, just came in and viola, you have this Thunbergia vine. Coincidentally, I have this plant by the side of my house too, I plant it mainly for shade and beauty, and of course everyday, you can expect visits from the carpender bees, and they are friendly bees, though visitors get scared of them. A thai lady friend of mine will always come and collect 20 to 30 leaves each visit, she brews them together with pandan leaves for 3 to 4 hours to make a cleansing drink, for deboweling, I tried it and I should say that it works very well. Now I brew the drink once a month to clear the accumulated rubbish in my bowels. Oh yes, the drink has a pleasant taste. Thought you and your readers may be interested to know. Thank you and God bless. Nice to hear from you again, EKLim! How lovely to have a garden plant that’s useful health-wise too! 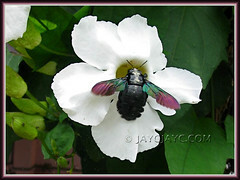 Do the flowers attract any kind of birds besides the carpenter bees and ants? Appreciate your sharing, thanks. God bless you too and have a great week ahead! I was very interested to plant this one in my garden until I found those huge red ants guarding jealously over the vine. I wonder whether this plant does well in pot & in a shaded area? 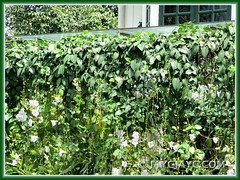 Just my humble opinion, James – this vine is vigorous growing with tuberous root system, so it may require a large pot. Also, it’s sun-loving and if sited at a shaded area, foliage may be luxuriant but flowers negligible. I WOULD BE VERY PLEASED TO RECEIVE INFORMATION ABOUT THE HAZARDOUS EFFECTS OF THIS KIND OF PLANT THUNBERGIA IN ANIMALS IF THEY EAT LEAVES, WEEDS OR PART OF THE STALKS BECAUSE WE ARE AFRAID OF CAUSE OF POISONING. THANKS IN ADVANCE FOR YOUR RESPONSE. We have this creeper on our compound wall in Bangalore ! Such a pleasure watching it bloom profusely, almost every day of the year. Ours is blue in colour. Its a host for ants, and a host of tiny creatures – generally harmless even to the other plants around it. Thanks for sharing your love of this beauty, Rajaram. Much appreciated. However, I had to remove your link to Flickr as it does not display the related plant.